Money from the U.S. Federal government may have helped pay for the guns and ammunition used by James Holmes to murder a dozen people and wound scores of others in the movie theater massacre in Aurora, Colo., July 20. This startling news was reported in the July 23 New York Times—but it was buried deep within the paper, halfway through a story about President Obama’s visit to Aurora. There is no reason to believe—as of yet—that anyone within any Federal agency was directing Holmes to buy firearms or ammunition. There is no hard evidence to suggest the involvement of any government agency in the incident in any way. But the fact remains that federal dollars were likely used to pay for the weapons and ammunition. “Oh, what a stretch!” some might exclaim. But is it? How would the Federal government itself view a situation in which an individual funneled $2,000 per month to someone who used that money to buy weapons and ammunition to commit a domestic atrocity against civilians? Would the Federal government be at all interested in looking into the matter to determine whether the funds were transferred with the intent to bankroll terrorism? If the Patriot Act and the United States Code are any guide, then the Federal government would be very interested indeed. In fact, Federal law provides for prison terms of up to 15 years for anyone who provides “material support” of terrorism and life imprisonment if such support results in loss of life.
. . . to commit an act that the actor knows, or reasonably should know, affords material support, including a safe house, transportation, communications, funds, transfer of funds or other material financial benefit, false documentation or identification, weapons (including chemical, biological, or radiological weapons), explosives, or training . . .
Should this transfer of Federal money to a man who bought arms and ammunition to commit an atrocity not at least be examined? Or is the Federal government above being held to its own standards of scrutiny? No one should be surprised that many on the American right support military action against the regime of Libyan dictator Muammar Gaddafi. Attacking countries that pose no threat to the U.S. is typically cheered by many American republicans, especially those of the neocon variety. What’s surprising is that many on the American left support the current aggression against Libya as well—surprising because American democrats typically like to portray themselves as anti-war and anti-imperialist. What makes the situation in Libya especially ironic is that American “progressives” of the left may, without knowing it, be supporting Libyan rebels who have committed—and may still be committing—atrocities against soldiers and civilians suspected of being aligned with the Gaddafi regime. These atrocities, by many reliable accounts, have included the lynching of black Africans. Yes, American liberals are throwing their support behind mobs that have lynched black people. Make no mistake: Muammar Gaddafi is a vicious tyrant who appears willing to do anything to cling to power, and his military forces have committed some atrocious acts of their own. What’s at issue here is the way in which a fairly typical civil war was been recast as a story of valiant civilians taking on a modern military force—and the way in which this contrived narrative has been used to get American liberals to go along with the war, if not enthusiastically support it. The official story of the war in Libya is being woven in order to bring the left in Europe and the U.S. on board to support a NATO military venture. Who stands to profit from this venture? Why, the usual institutions, of course: military contractors, big banks, and multinational corporations that are in the business of extracting mineral and fossil resources from nations whose leaders have defied the western corporate empire in one way or another. The reason the Libyan venture enjoys the support of the American left is that the left has been deceived into believing NATO’s aggression against Libya is a humanitarian mission. This belief is based on flimsy propaganda that many appear to have accepted without asking the most fundamental questions or exercising the most basic skepticism. Think back to the accounts from the early days of the war about Libyan jet fighters strafing civilians. It turns out that the strafing probably never happened. And yet many still believe it occurred. The reports of Libya mobilizing its air force against its own people spread quickly around the world. However, Russia’s military chiefs say they have been monitoring from space—and the pictures tell a different story. According to Al Jazeera and BBC, on February 22 Libyan government inflicted airstrikes on Benghazi—the country’s largest city—and on the capital Tripoli. However, the Russian military, monitoring the unrest via satellite from the very beginning, says nothing of the sort was going on on the ground. At this point, the Russian military is saying that, as far as they are concerned, the attacks some media were reporting have never occurred. (Reuters) – The U.S. envoy to the United Nations told the Security Council on Thursday that troops loyal to Libyan leader Muammar Gaddafi were increasingly engaging in sexual violence and some had been issued the impotency drug Viagra, diplomats said. 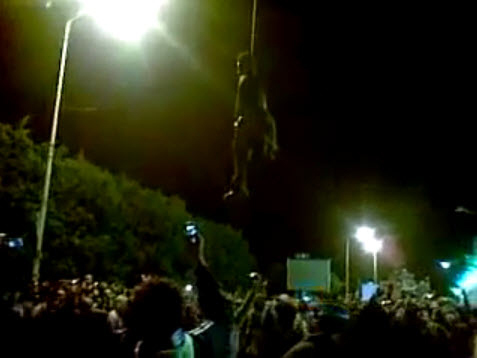 Several U.N. diplomats who attended a closed-door Security Council meeting on Libya told Reuters that U.S. Ambassador Susan Rice raised the Viagra issue in the context of increasing reports of sexual violence by Gaddafi’s troops. “Rice raised that in the meeting but no one responded,” a diplomat said on condition of anonymity. The allegation was first reported by a British newspaper. An attempt to persuade doubters the conflict in Libya was not just a standard civil war. In other words, the Viagra story was propaganda, pure and simple, and rather preposterous propaganda at that. Likewise, the story of jets strafing civilians appears now to have been invented in order to “persuade doubters” that the Libyan civil war was a war worth intervening in. The American left would probably never support intervening in a “standard civil war.” But how about a war in which a cartoonish bad man is doing mean things to women and children? Now there’s a war “progressive” liberals can get behind and cheer for. Never mind if the narrative used to justify it is fiction. As stories like the ones about the strafing jets and the Viagra were finding prominent play in the western corporate press, there were other stories, less prominently reported if reported at all, about atrocities being committed by the anti-Gaddafi rebels. Even today, such reports are murky, difficult to trace back to their sources, and rarely reported by the U.S. and European press. I moved on to other prisoners who had also been trotted out for photographs and questions. The whole scene had an unsettling feel, as if these men had already been tried and convicted—and all that was left were their executions. In a strange twist, I learned that internal security officers of the Kadafi regime formerly used the facility to detain, torture and kill political dissidents. A representative from Human Rights Watch looked on silently, taking notes but declining to comment on the proceedings. All I know is that the Geneva Convention explicitly prohibits prisoners of war from being paraded and questioned before cameras of any kind. But that’s exactly what happened today. The whole incident just gave me a really bad vibe, and thank God it finally ended. Just when I thought this war couldn’t get any weirder, it did. Reports that anti-Gaddafi rebels have systematically rounded up and murdered black Africans have come through official channels as well, but none of these reports has seen wide dissemination through the U.S. or Europe. These reports, after all, don’t fit the official narrative—the heavily promoted view that the rebels are the good guys. N’DJAMENA, April 3 (Reuters) – Chad on Sunday called on coalition forces to protect its citizens in rebel-held areas in Libya, saying dozens had been accused and executed for allegedly being mercenaries in the pay Libyan leader Muammar Gaddafi. When protests against Gaddafi’s government led to violence in February, rebels said Gaddafi had brought in African mercenaries from countries such as Chad and Zimbabwe to help in the crackdown after Libyan troops proved unreliable. “Since the beginning of the Libyan crisis, Chadians in Libya, especially those in areas controlled by the transitional national council, have been singled out,” a statement from Chad’s government spokesman Kalzeubet Pahimi Deubet said. “Dozens of Chadians have known this sad fate,” he said. The statement said several Chadian nationals had been arrested, some were “paraded on television as mercenaries and sometimes executed” despite denials that Libya had recruited any mercenaries from its southern neighbour. The government of Chad had said about 300,000 of its citizens resided in Libya before the crisis. “The Chadian government is calling on international coalition forces involved in Libya and international human rights organisation to stop these abuses against Chadians and other migrant Africa workers,” the statement said. At the same time reports and videos like these were trickling out, members of the U.S. Congress were arguing over President Obama’s decision to commit U.S. forces to the NATO venture without congressional approval. The president’s lawyers argued that the U.S.’s role in the NATO invention didn’t rise to the level of full military engagement. Thus, the argument went, the president wasn’t constitutionally obligated to seek approval from Congress. Several resolutions came to the floor of the U.S. House of Representatives in late spring seeking either to support or to block the president’s commitment of U.S. airpower to NATO’s invention in Libya. Curiously, the majority of republicans opposed intervention, while the majority of democrats supported it. This reversal of standard roles may be attributed to two factors: the portrayal of the Libyan civil war as a story of intrepid civilians fighting a comic-book villain, and the impulse among democrats to go along with anything the president proposes—along with the equivalent impulse among republicans to defy the president at every turn. “Although the president does want to see Muammar Gaddafi gone, that the mission, the use of force is to protect civilians and I understand not wanting another Rwanda on our hands. If you ask Bill Clinton, one of the regrets [was not getting involved in Rwanda],” Schakowsky said. Never mind that the “civilians” in Libya being protected by NATO constitute a well-organized and armed militia that’s committing war crimes. And never mind that Rwanda was a different situation altogether—one in which mass murder was committed not by a strong-armed dictator but by masses of civilians settling old tribal scores. In fact, if anything, destabilizing and removing Muammar Gaddafi, bad as he is, could have the unintended consequence of unleashing the very sort of lethal tribal animosities that Schakowsky and others like her say they want the U.S. and NATO to prevent. In the same interview, Schakowsky also said that she’d like to see how the U.S.’s military’s intervention “turns out.” A wait-and-see approach is perfectly understandable for one who enjoys the security and trappings of congressional office and has reelection to think about. The same sentiment, however, could hardly be expected to be shared by someone in Libya facing the imminent threat of a lynch mob. In such a situation, waiting to see how things “turn out” probably wouldn’t be an attractive option. Several questions remain unanswered. Why has the American left failed to ask difficult questions about Libya? Is it possible that American liberals are loath to question a president in whom they have so much invested emotionally? Is it possible that they are so thoroughly compromised by political contributions that they must remain silent? Are they simply not well informed? Perhaps more to the point: If they are aware that the rebels they’re backing have lynched black people, how do the supporters of the Libyan intervention—particularly “progressive” democrats, who claim to be motivated by a passion to defend the little guy—look themselves in the mirror? The Feds hate cash because it’s nearly impossible to track and control. Now they’re dangling the carrot of early tax refunds to get people to adopt their new card. Predictably, they’re going after the segment of the population that’s least savvy about personal finance—the savviest avoid being in the position of being owed money by the Treasury in the first place. The Treasury Dept. laughingly claims that this card gives users more control over their finances. The truth is that it will give the federal government and the banks that own it greater control over private accounts. WASHINGTON – Timed for tax season, the U.S. Department of the Treasury launched a pilot today to offer taxpayers a safe, convenient and low-cost financial account for the electronic delivery of their federal tax refunds. The new account card option provides everyday money-saving conveniences and consumer protection features for Americans with limited or no access to traditional banking services. As the next step in this pilot, originally announced in September, Treasury will mail letters next week to 600,000 low- and moderate-income individuals nationwide. The letters will invite these taxpayers to consider activating a MyAccountCard Visa® Prepaid Debit Card in time to have their 2010 federal tax refund direct deposited to the card. Compared to paper checks, direct deposit provides a safer, faster and more convenient way to receive a federal tax refund as well as other regular income. Also this week, Treasury began a companion pilot to encourage tens of thousands of current and potential payroll card users to direct deposit their 2010 federal tax refund onto existing payroll cards. Nationwide, more than 1.7 million workers use payroll cards to receive and access their wages, often because they do not have bank accounts. Working with ADP, a provider of payroll services, Treasury will highlight the safety, ease and convenience of direct deposit onto payroll cards through tax season communications, including materials distributed with pay statements. Read more at the U.S. Dept. of the Treasury.